The No. 6-ranked and undefeated Washington Huskies won a nail-biter against the Hawai’i Rainbows (nicknamed “the ‘Bows”) in Honolulu, Hawai’i at the Outrigger Resorts Volleyball Challenge. With their win the Huskies were crowned the tournament champions. Although Washington was the victor, Hawai’i led in nearly every statistical category. The ‘Bows led in total points 90 to 89, kills 73 to 70, hitting percentage .265 to .256, blocks 12 to 11, assists 70 to 62, and digs 79 to 75. The only category that Washington led in was aces, 8 to 5. Individually, Washington was led offensively by Crissy Jones with 22 kills, Courtney Schwan with 19 kills, and Tia Scambray with 16 kills. Destiny Julye from Washington led the match with 3 aces, while Bailey Tanner had the most assists with 56. Hawai’i was led by Nikki Taylor with a career-high 29 kills, McKenna Granato with 17 kills, and Emily Maglio with 11 kills. Norene Iosia had the most assists for the ‘Bows with 53. On the defensive side of the ball, Kara Bajema had 6 blocks for Washington, and Scambray contributed 4. Scambray also racked up 22 digs, while Schwan had 20. For Hawai’i, Taylor had 7 blocks and Casey Castillo and Emily Maglio had 5 blocks each. Savanah Kahakai collected 23 digs, and Iosia wasn’t far behind with 20. Washington’s next match will be this Thursday, September 15th, against Maryland in Los Angeles, California. Hawai’i will face off against Pepperdine this Friday, September 16th. HONOLULU – Washington won’t soon forget its first trip to Hawaii since 2008, as the sixth-ranked Huskies got pushed, and pushed back, against 14th-ranked Hawaii, coming out on top after five sets and nearly three hours, 25-23, 17-25, 28-26, 23-25, 15-13. In a match pitting two Elite Eight squads from 2015, the Huskies (8-0) got their biggest win of the still-young 2016 season, claiming the tourney title at the Outrigger Resorts Challenge, in front of 6,856 vocal fans at the Stan Sheriff Center. Junior Crissy Jones earned tournament Most Outstanding Player honors, an award she cemented with a career-high 22 kills tonight, hitting .300 and serving a pair of aces. Fellow juniors Courtney Schwan and Tia Scambray were also named to the All-Tournament Team, as Schwan had 19 kills and 20 digs, hitting .415 tonight, and Scambray had 16 kills with a career-high 22 digs and two aces. Junior Bailey Tanner dished out a career-high 56 assists and added 10 digs as well. The Huskies hit .256 for the match while the Rainbow Wahine (5-4) finished at .265. Washington had one of its best serving matches thus far with eight aces compared to five for Hawaii. Destiny Julye had three of those aces, after coming into the match with just one ace in her career. Freshmen Kara Bajema, Avie Niece, and Shayne McPherson all contributed in the tough road environment, as Bajema had nine kills and six total blocks, Niece had three block assists, and McPherson had 11 digs. The first and third sets were especially wild, as in set one, the Huskies built an eight-point lead, but saw Hawaii come back and get within one point on three occasions. But the Huskies held off UH every time and pulled out the win on their fourth set point try. In the third set, it was the Huskies rallying from down 14-20, and saving four set points in a row, and six altogether, before winning, 28-26, on their first chance. The final set was level at 13-all before the Huskies got to match point on a Schwan kill and finished it on a Jones rejection. Schwan picked up the first two points of the match for the Huskies, killing from the right, then hitting down a joust after her block attempt popped it up. The first kill from Jones had the Dawgs up early, 3-2. Destiny Julye floated an ace off the defense to make it 6-3 Dawgs. A quick kill from Kara Bajema and a Hawaii miscue put the Dawgs up four, then Jones laid out for a one-fisted dig, and Tanner found Scambray for a kill for 9-4 and Hawaii called timeout. Out of the break, Jones sailed a long bump set over her head to Scambray who terminated to keep the run going. The Dawgs kept the formula working as another dig from Schwan led to Scambray killing in transition for a 12-4 lead before Hawaii broke through to end the six-point Husky run. Hawaii tried to send over a free ball but Bajema jumped up to spike it down for 13-5, but the Huskies then gave up a 4-0 run and took timeout with the lead down to 13-9. Hawaii got its run to six points to match UW’s earlier burst, but Schwan broke through for the Dawgs to stem the tide and keep UW on top, 14-11. Destiny Julye‘s first kill off the block made it 15-12 Dawgs. Scambray and Bajema got UW’s first block of the match to maintain the lead, and then Jones served an ace for 19-16. Scambray and Bajema then crushed another Hawaii swing straight down for a third-straight point for 20-16 and Hawaii took its last timeout. Jones stepped right back up and served another clutch ace out of the timeout before Hawaii got the sideout on its next chance for 21-17. Hawaii then got its first block of the match, and got a kind roll on a serve off the tape for an ace and UW took time at 21-19. UW was called for a double on the next point as Hawaii got within one again, but Tanner dumped for a kill to fend off the tie once again, and then Hawaii hit into the net on the next point for 23-20. The Huskies won a long rally to get to set point as Schwan killed a Hawaii overpass. Hawaii saved the first three, pulling within a point for the third time since UW took the big early lead, at 24-23, but Tanner went to Jones out of the back row on set point number four, and Jones found the back line to close out the dramatic set, 25-23. Washington hit .394 in the set and had three aces, while Hawaii hit .286 with one ace. Schwan had five kills and Jones added four. Hawaii came out with four of the first five points in the second set, with Jones earning a couple early kills to keep the Huskies in contact. Jones smashed a third kill in five points to make it 5-6. Bajema was blocked on a slide and then the Huskies got aced as part of a 3-0 Hawaii run, with Scambray stopping the run by winning a joust at net. Jones and Schwan landed consecutive kills to get the Dawgs back to 8-10, but Hawaii answered back with a pair. The Dawgs countered again with a Julye smash through the block and a Schwan roll shot for 10-12, but again Hawaii got the next sideout and then served up an ace for 10-14 and the Huskies took timeout. The Huskies stalled on offense, and Hawaii won three of the next four points to build a 17-11 lead and UW used its last timeout. Jones and Avie Niece got the Dawgs back to the service line with a big stuff on the right pin for 12-17. Scambray and Jones added kills but the Huskies still trailed 15-21. Hawaii got to set point at 16-24. Schwan saved the first with a kill, but the Rainbow Wahine put it away on the next point to finish the set, 25-17. Jones snapped down a kill set by Tanner to start the third set on the right foot. The Dawgs tied it at 3-3 but then Hawaii won a pair of wild rallies to push in front, 3-6. Washington made three net violations and needed the early timeout down 4-9. Jones got UW the kill in serve-receive out of the timeout, and after a good block touch, Jones tipped for another point to get back to 6-9, but Hawaii came right back with another 3-0 run, blocking the Dawgs twice for 6-12. Bajema put away an overpass as the Dawgs crept within four again at 8-12. A Jones finish was followed by an ace from Scambray as she floated one short for 11-14. Scambray’s next serve also threw UH out of system and they swung into the net for 12-14 and Hawaii took time. The Rainbow Wahine killed a UW overpass to stop the run, but Schwan answered with a kill for 13-15. Hawaii took the next two points to push ahead, 13-17, and UW took time. Hawaii was in the net for a Jones kill out of the break, but UW gave it right back on a service error. The Huskies then made two more errors to fall behind by six. Julye came off the bench to serve and found the seam for an ace straight to the court as the Dawgs climbed back within three again at 18-21 and UH called for time. Another line drive float from Julye was overpassed and Bajema killed it for 19-21. But Hawaii got a kill and then aced the Huskies for 19-23. Scambray got a clutch kill on a tough inside set, but UH answered to get to set point at 20-24. In a reversal of the first set, it was the Huskies that saved three consecutive set points, but the Dawgs took it one step further, and saved the fourth to tie it up at 24-all. Jones killed to save the first, then UH sent one long, and Jones followed with a tip over the block to get to 23-24. A long rally ended with Tanner finding Schwan who put it away on the left as the Dawgs roared. But after pulling even, Scambray’s next serve found the net, giving UH a fifth try. Schwan banged off the block and it went wide on UW’s side for 25-up. Hawaii earned another with a kill in serve-receive. Scambray’s next pass went up above the net, but Tanner saved it by winning a joust for a kill. UW finally went ahead after a Hawaii hitting error. On their first set point try, Tanner drove her serve deep and the Hawaii defender shanked it over and out by the up ref for an ace and the Dawgs had completed the comeback, 28-26. The Huskies found themselves in an early 1-5 hole in set four and had to burn an early timeout to regroup. UW dug in to win a couple long rallies out of the break with Scambray and Schwan finding room. Bajema then used a UH free ball attempt as a set and she smashed it for a kill to get back within 4-5. Jones finished with authority out of the middle off a Tanner quick for 7-9. Jones crushed two more as the teams continued siding out back and forth. Scambray dropped another ace short to pull UW within a point at 11-12, and the Dawgs then tied it up at 12 after forcing a Hawaii error, Scambray nearly running into the tunnel to extend the play. Another marathon rally was finished by Schwan off the block as the Dawgs took their first lead at 13-12 and Hawaii took timeout. UH came out with two in a row to retake the lead, but missed its serve for 14-all. The Rainbow Wahine got two more to go on top, 14-16, with Schwan coming up with a big kill to stop the run. Schwan and Niece had a crucial roof to make it 16-17. Tanner had a long running back set to Jones who finished crosscourt from the right for 17-18, and the Dawgs then tied it back up with a rejection from Scambray and Bajema. Jones picked up a tip and Scambray finished in transition as UW went back ahead, 19-18. The Dawgs got a fourth-straight point as Jones and Bajema rejected Hawaii’s swing for 20-18 and Hawaii used its final timeout. Out of the break, Bajema won in a joust with the Hawaii setter to get one more point before Hawaii snapped Julye’s serving run. Hawaii then finished after a Jones tip was pancaked to make it 21-20 and the Huskies used their final timeout. UW had to send a free ball over on the next point and Hawaii finished to tie it at 21-21. Scambray put UW back up with a leftside kill in front of the libero, but Hawaii responded to tie again. Scambray then had a tip fall just wide as Hawaii retook the lead, but Scambray answered back with a big kill for 23-all. UW had a swing at the next point but Hawaii pulled out the long rally to get to set point at 23-24, and the Huskies got in trouble with a poor pass and Hawaii finished their chance to take the set, 25-23, and send things to a fifth. The 20th kill for Jones made it 1-1 in the fifth set. Hawaii inched ahead, 2-4, but UW got the next two to even it up, and then Scambray finished a long rally with a deep blast to give the Huskies the 5-4 lead. 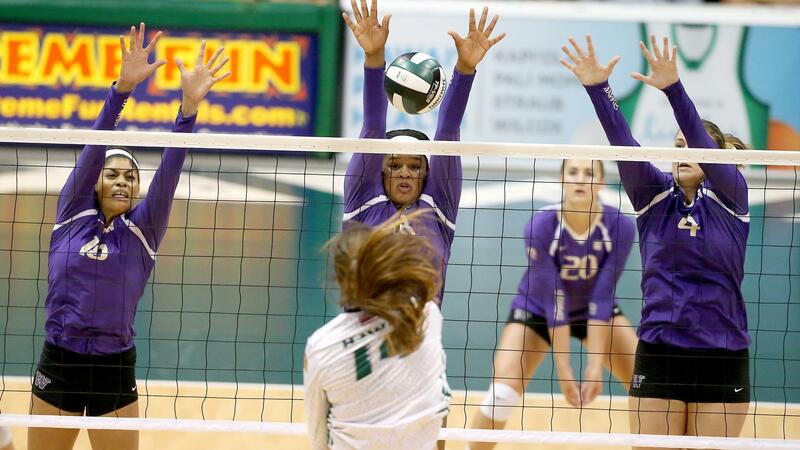 Hawaii battled back with a 3-0 run, but Jones ended it with a rightside finish for 6-7 Rainbow Wahine. Julye then floated an ace to the far corner to tie it again, 7-7. A Hawaii error put the Dawgs back up, 8-7. Julye hit another great serve that was overpassed and Bajema put it down at the sideline for 9-7. Hawaii got a kill down just inside the block to snap the 4-0 Husky run for 9-8. Scambray came right back with a kill on the left for 10-8 Dawgs, then Bajema and Tanner roofed the Hawaii swing on the right for 11-8 and Hawaii took its final timeout. The Dawgs had several swings at the next point but Scambray’s last was blocked for 11-9 and UW called time. Hawaii had another block, and then came up with some amazing digs to earn a third straight point to even it up at 11-11. Jones hit into the block from the back row and it went all the way out long on UW’s side to get UW back serving up 12-11, but Hawaii got a kill on a touch call that had to go to replay to be overturned after initially being called long. Hawaii did in fact hit the next one out for 13-12 Dawgs, and Hawaii took its final timeout. UW got a free ball but couldn’t convert out of the break and Hawaii tied it up. The Huskies got to match point as a Schawn tip was shanked out of bounds. On the next point, Tanner served, and Jones read Hawaii’s Maglio all the way, jumping up to stuff down the shot and seal the Husky win, 15-13. Washington will have a quick trip home to Seattle, leaving again on Wednesday for the final nonconference stop of the season, going to Los Angeles for the Pac-12 Challenge where they will face Maryland on Thursday and Oklahoma on Friday at USC’s Galen Center. The two matches will be UW’s first appearances on Pac-12 Networks. HONOLULU—The No. 14 University of Hawai’i women’s volleyball team (5-4, 0-0 Big West) fought as hard as they could, but came up just short in a five set heartbreaker against No. 6 Washington 23-25, 25-17, 26-28, 25-23, 13-15. With the win, the Huskies captured the championship of the Outrigger Resorts Volleyball Challenge. Nikki Taylor led the ‘Bows with a career-high 29 kills and a season-high seven blocks on Sunday night in the Stan Sheriff Center. Taylor also recorded a career-high with 70 attacks and 33.5 points (her previous high was 27 kills, 63 attempts and 31.5 points against Florida a year ago today). She hit .257 for the night with 11 errors. She also added two assists, a service ace and eight digs. Taylor was one of three Rainbow Wahine hitters who notched double-digit kills. McKenna Granato tallied 17 kills and was a dig short of her second double-double with nine digs. She hit .200 with eight errors in 45 swings. Granato posted a pair of service aces as well to fill her stat line. Emily Maglio added 11 kills and had just one error in 20 attempts for a .500 hitting percentage. Maglio and Casey Castillo both had five blocks apiece. Castillo tied her career high set against Northern Illinois earlier in the tournament. Setter Norene Iosia posted her third double-double of the season with 53 assists and a career-high 20 digs. She also had three kills and combined on three blocks. UH libero Savanah Kahakai led UH with 23 digs. It is the fourth time this season that she has recorded over 20 digs in a match. In the first set, Washington was on cruise control early, leading by as many as eight points at 12-4. But the Rainbow Wahine would chip away at their deficit, beginning with a 6-0 run on the serving of Clare-Marie Anderson highlighted by a pair of Kalei Greeley kills and one kill each from Maglio and Granato plus a hitting error from UW which cut UH’s deficit to 13-11. Hawai’i trailed by just one point at 16-17 before the Huskies reeled off four straight points to go up 21-16 from which UH could not recover. UW ended up winning the first set 25-23. The second set was a much different story, with the ‘Bows leading from start to finish except for an early tie at 1-1. Hawai’i scored in small bunches throughout the frame to win 25-17 with freshman Kirsten Sibley getting the final kill off an assist from Iosia. Hawai’i kept the momentum going in the third set, leading for most of the set and by as much as six at 20-14. But, from that point, the Huskies came charging. UW tied the set at 24-24, 25-25, and 26-26 before taking the lead at 27-26 and then winning the set at 28-16. Hawai’i squandered five set points down the stretch and UW won eight of the last 10 points to close out the set and take a 2-1 lead in the match. The fourth set saw the momentum swing back-and fourth between the two teams. Hawai’i jumped out to a small lead early, until UW was able to go on a 4-0 run to catch and overtake UH to a 13-12 lead. Later, the Huskies would go on a 5-0 run to take a 21-18 lead, but a UW attack error and back-to-back kills by Taylor knotted the score at 21-21. UH would tie the score twice more before UH snuck away with a 25-23 win on kills by Taylor and Maglio end the set and force the fifth. In the fifth, after UH held the early lead, UW scored four-straight points to go up 11-8. Hawai’i, however, countered with a 3-0 run to tie the score at 11-11. Taylor tied the score again at 13-13, but the Huskies would score the final two points to win set five and the championship match of the tournament. Washington was led by Crissy Jones who had 22 kills with just four errors in 60 attacks for a .300 hitting percentage. Tia Scrambray added 22 digs and Kara Bajema had six blocks. Hawai’i will finish its non-conference portion of its schedule this coming week with a pair of matches against Pepperdine on Sept. 16 and 17. On the 17th, UH will also host its annual Alumnae Game at 5:00 pm prior to the 7:00 pm match.